Hans-Wilhelm Steinfeld’s remarks on Polish-Jewish relations in Lviv/Lwow seems to the work of an amateur historian who is unfamiliar with the basic sources and the complicated issues involved in Polish-Jewish relations during the Second World War. His lack of basic understanding leads to grotesque simplifications and employment of handy stereotypes. Steinfeld’s response to the Polish ambassador to Norway ends up as a largely disconnected series of accusations thrown together in an incoherent and defensive manner. In his remarks, Steinfeld cites primarily non-scholarly sources. The one doctoral dissertation he cites is from 1956. The development of Holocaust studies and the proliferation of important writings on Polish-Jewish relations make such a work obsolete at best and irrelevant at worst. Most of his citations are from memoirs, which are particularistic by their very nature and not helpful in presenting any broader perspective. This leaves aside the question of whether those memoirs are accurate in all their particulars, whether they show bias, etc. Finally, Steinfeld cites the book Mila 18 by Leon Uris, apparently unaware that it is a work of fiction. These facts alone should lead us to question his remarks about Poland, Lviv, and Polish-Jewish relations. Let us now turn to some of Steinfeld’s more serious errors. The seizure of Vilnius in 1920 in the wake of the Polish-Soviet War was certainly condoned by Pilsudski along with virtually all other Polish leaders but simply had nothing to do with Polish-Jewish relations. Moreover, the seizure took in a situation in which there were no demarcated, legally established borders. Vilnius was at the time a majority Polish city and its fate in dispute. It had been seized successively by Polish, Lithuanian, Soviet, and Lithuanian forces (in that order) in space of less than two years prior to the final Polish takeover. Poland’s seizure of the city was never seriously challenged or disputed by the international community or the League of Nations. Finally, Pilsudski never enacted or condoned anti-Semitic legislation. Rather he was and is considered philo-Semitic. Jews had served as comrades in his military endeavors since his days as a leader of the secret Polish Military Organization prior to World War I. He promoted Jews within the army and government and the eulogy at his funeral in 1935 was given by a Jewish fellow officer. Several Jewish parties, including the largest, Agudat Israel, were supporters of the pro-government bloc in the Polish parliament during the period of Pilsudski’s rule. Following Pilsudski’s death, a weak coalition of military officers and politicians ran the Polish and did implement some anti-Semitic legislation. It was never fully implemented and the governing parties suffered a significant backlash in the 1938 local elections. The governing party’s effort to appeal to anti-Semitic elements in Polish society was a failure since it alienated many supporters and never went far enough to please die-hard anti-Semites. Summary: Steinfeld’s discussion of Jozef Pilsudski and the pre-war Polish government is clearly incompetent. Such inaccurate statements and departure from established facts would not be accepted even among high school students. Facts: Menachem Begin’s hatred of Poles and his statements to this effect have long been an embarrassment to moderate Jews, especially those engaged in building better relations with Poles. No scholar of Polish-Jewish history would cite his work. That said, there is no question that virtually everyone in eastern Poland and Lithuania longed for an end to Soviet rule in the period 1939-40. The Soviets engaged in mass killings, deportations, and torture. Under the Soviet rule the region suffered economic collapse, hunger, and disease. Conditions in late 1939-June 1941 were often worse under the Soviets than under the Nazis. Even some Jews who found themselves in the east as refugees petitioned to return home, even if that meant returning to the Nazi-occupied zone. Nevertheless, no Polish nationalist longed for Nazi rule. The position of the Polish nationalists was clear and consistent throughout the war: both Nazis and Soviets were enemies of Poland and were to be fought with all means necessary. Summary: Steinfeld’s apparent lack of knowledge about conditions under Soviet rule is shocking for such a publicly known figure. His use of Begin’s memoir demonstrates his unscholarly approach. Facts: The above quotes are Steinfeld’s only attempt to address the situation in Lviv, the ostensible subject of his original remarks. Occasional acts of violence against Jewish students and efforts to impose quotas in Polish universities are known facts. However, violence (which was often mutual) was the exception. There were plenty of examples of good relations between Polish and Jewish students and of professors and students opposing ethnic violence. Efforts to impose quotas on Jewish admittance were highly controversial, but the attempt was common throughout Europe and North America. Most major American universities, for example, had similar quotas to restrict Jewish admittance. In other words, this was hardly a specifically Polish problem as Steinfeld suggests. 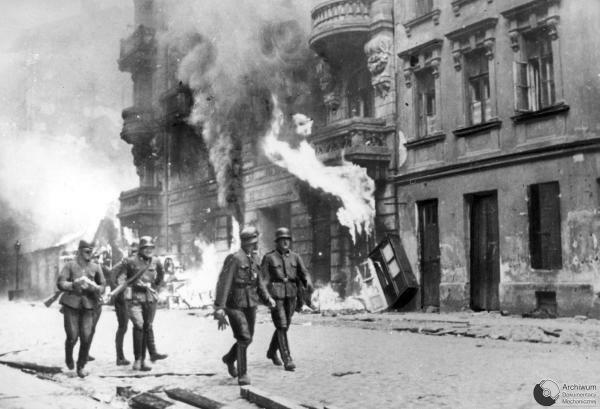 The claim that Poles engaged in a pogrom following the Nazi takeover in Lviv in 1941 is not supported by any significant scholarly or memoir text. Simon Wiesenthal, whom Steinfeld seems to cite copiously, wrote that pogroms were conducted by Ukrainian police and militia, not Poles (Justice Not Vengeance, 1989, p.34, 36). This is further reinforced by the official websites of the U.S. Holocaust Memorial Museum and Yad Vashem (http://www.ushmm.org/wlc/article.php?lang=en&ModuleId=10005171 and http://www1.yadvashem.org/odot_pdf/Microsoft%20Word%20-%206457.pdf). The most competent discussion of this matter is found in Raul Hilberg’s The Destruction of the European Jews, 1961, p.202-207. It was certainly true that there were denunciations of Jews by Poles in Lviv and elsewhere. These were usually done for profit rather than ideology and while too common were overall rather rare in spite of what some memoir literature appears to suggest. (This phenomenon is discussed in detail in Gunnar S. Paulssen, Secret City: The Hidden Jews of Warsaw, 1940-1945.) Moreover, denunciations were committed by virtually every ethnic group. Jews in particular were vulnerable to denunciations by fellow Jews. In other words, there was nothing specifically Polish about denunciations. Steinfeld also fails to mention that a large number of Poles from Lviv helped to rescue Jews. Although exact figures are unknown at least 10 Poles are known to have been executed in Lviv for helping Jews and several Polish villages near Lviv were wiped out by German and/or Ukrainian forces for assisting Jews. The most remarkable rescuer in Lviv may have been Prof. Rudolf Stefan Weigl, the world-famous typhus researcher who not only protected students and colleagues but also produced secret batches of typhus vaccine that were smuggled into the Lviv Ghetto. Also active in rescue activities were Polish Catholic clergy including bishops, priests, monks, and nuns. (See for example, Andrzej and Karolina Jus, Our Journey in the Valley of Tears (Toronto, University of Toronto Press, 1991). Eleven Catholic convents in Lwow alone sheltered Jewish children. Summary: Steinfeld’s remarks not only demonstrate a complete lack of knowledge about the history of Lviv and the Holocaust in Lviv, they omit mention of any Polish activities that do not fit his pre-conceived notions about “Polish Nazis.” The claim about Poles participating in the 1941 pogrom against Jews is totally unsupported by any evidence. The fact that he relies on a 48-year old doctoral dissertation and ignores well known print and on-line sources that paint a completely different picture further call into question his scholarly credentials. Fact: The facts of the Jedwabne incident have generated copious literature in Polish and English and many of the facts of the case remain in dispute. However, few scholars now support the claim of 1600 Jewish casualties. A figure of 300-400 is more likely. Also, Jedwabne is somewhat less than 500 km north of Lviv. Regardless, the mention of Jedwabne is wholly out of context in a discussion about Lviv. One could just as easily claim “Norway, which is 1,400 km north of Lviv, had a government run by a Nazi collaborator.” This simply tells us nothing about the situation in Lviv. Summary: Steinfeld’s mention of Jedwabne in this context is totally irrelevant. Facts: First, the Armia Krajowa (AK) was the only significant Polish resistance movement. Aside from some small right-wing groups, there was no other Polish resistance movement. Polish communist groups were totally controlled from Moscow and since they sought Poland’s subordination to the USSR are not considered part of the Polish resistance movement but of the Soviet imperium. Second, the Polish resistance provided significant aid to the Ghetto fighters, primarily to groups organized by the Jewish Bund and the Zionist-Revisionist ZZW. About 55 members of the AK died alongside the members of the Jewish resistance. Third the book Mila 18 is a fictional account of the Ghetto Uprising. Summary: Steinfeld’s reliance on a work of fiction further demonstrates his incompetence. Concluding Remarks: There can be no question of treating Steinfeld’s remarks as those of a serious scholar or even a competent popular writer. Any scholar of Holocaust studies or Polish history could debunk his views without even opening a book. His claim about “Polish Nazis” in present-day Lviv is ludicrous and the “historical evidence” he has presented here is not to be treated seriously. If this is any indication of his work, it is very surprising that he is employed in a responsible position by major media in Norway or anywhere else. Anti-Semitic legislation: The major piece of legislation was in 1937, which was a ban on many forms of ritual slaughter. There is no information on how well this was enforced, but apparently not very effectively. It is mentioned in few Jewish memoirs of that era, even ones that are strongly anti-Polish. There were also so-called Sunday closing laws, which tried to banned commercial activity on Sundays. This was very hotly debated and receives more mention by Jewish writers. Sunday closing laws were also in place in many countries, including the U.S. and throughout Europe. Adoption of these laws was not necessarily a result of anti-Jewish feeling. There were also efforts to boycott Jewish-run businesses, some of which were supported by government officials, but no laws were passed. The boycotts were largely ineffective. Jewish business dropped but mainly as a result of the Depression. Ghetto benches: This was an effort to segregate Jewish students to the back of the classroom in university lectures. The first efforts were made in 1935, but this was not national legislation but policies undertaken by universities (though again, with the approval of some government officials). There was a history of ethnic violence at interwar Polish universities and Poles were not always the instigators. In 1930, riots broke out in Wilno after Jewish students murdered a right-wing student activist. The ghetto benches were resisted by most Jewish students who stood through the lectures rather than sit in the designated benches. They were joined by some Polish students and faculty."